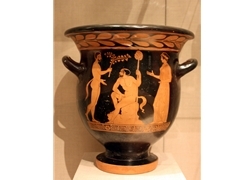 The Amykos was a young member of one of the first significant workshops of South Italian vase-painting. The Dioysiac subject matter and wiry drawing testify to Athenian influence. The verticality in both the shape and figure reflects the beginning of an artistic sensitivity quite different from that o mainland Greece.